Believe me, I used to be at the front of the line making fun of wine folk for picking guava, pomegranate, shoe leather, pencil shavings and innumerable other bizarre tastes and aromas out of a glass of boozy grape juice. The whole process seemed overwrought and fanciful at best and horribly pretentious at worst — not the kind of thing I’d ever sign off on. But as I started getting more and more into wine, and then as I started WRITING about being into wine, I began to see the method to the madness (or I drank the Kool-Aid and joined the legions of uptight overanalyzers, depending on your point of view) and understanding the necessity behind the efforts people put into sorting out what’s in their glass. By far the coolest and most interesting thing about wine is that, unlike almost any other alcoholic beverage that starts out from a piece of fruit, it ends up smelling and tasting like so many other things apart from, or in addition to, its source material. Apple cider tastes like apples; dark rum tastes like molasses; wine tastes like everything, and the more different wine you try, the more words and comparison references you need to describe it. This, I’ve learned, is doubly important if you ever want to put this description in writing and give a reader who may have never heard of your wine a flavour impression that sets it apart…suddenly descriptions like “plum” and “cranberry”, and its weirder, more memorable cousins like “Band-Aids” and “pickles”, become totally invaluable. First Impressions — Pay Attention! : The first thing that hits you when you smell or taste a wine will in many cases be one of your lasting memories about it, which makes it a great jumping-off point for a flavour profile analysis. I mentioned Band-Aids and pickles above because I distinctly remember the two wines that immediately jammed that impression into my head — the Band-Aid wine was a smelly, meaty Pinotage from South Africa that I had in WSET class, while the pickles wine was a cheap and terrible $11 Chilean Syrah that a friend of mine brought (twice) to a blind tasting and that was universally reviled. I won’t say that there are no wrong answers in wine flavour sleuthing, but I will say that your first impression about a wine has the least chance of being wrong. The more you go delving back into the glass, the more you’re liable to start picking up flavours that you’re hunting for as opposed to letting them come to you, so your initial sensory experience can be your most honest. This means you have to be ready for your first sniff: that’s when your nose, palate and mind are a blank canvas, so focus in and let the wine show itself to you. 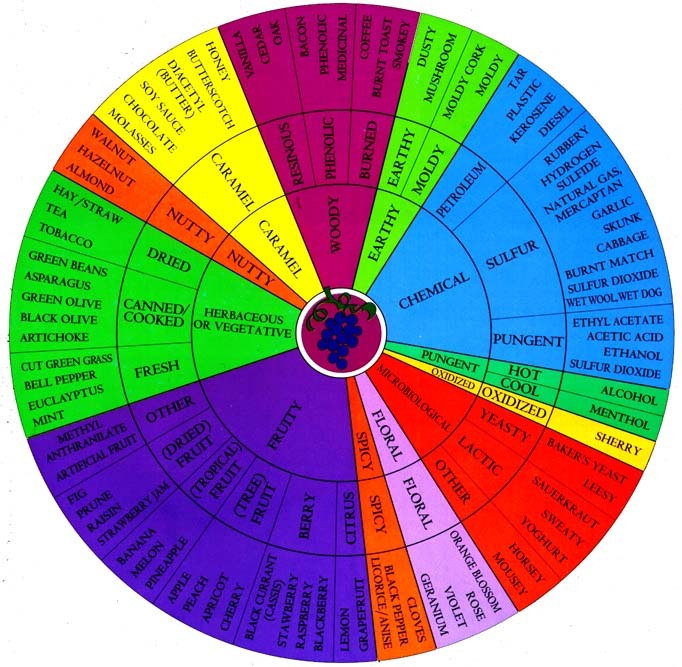 Basic wine flavour groupings are in the centre -- great work (and copyright) Ann C. Noble. Process of Elimination: When you’re looking for descriptors from a particular flavour group, you can make your job even easier by whittling out what the flavour note ISN’T to help you settle on what it IS. Fruit is the easiest example. 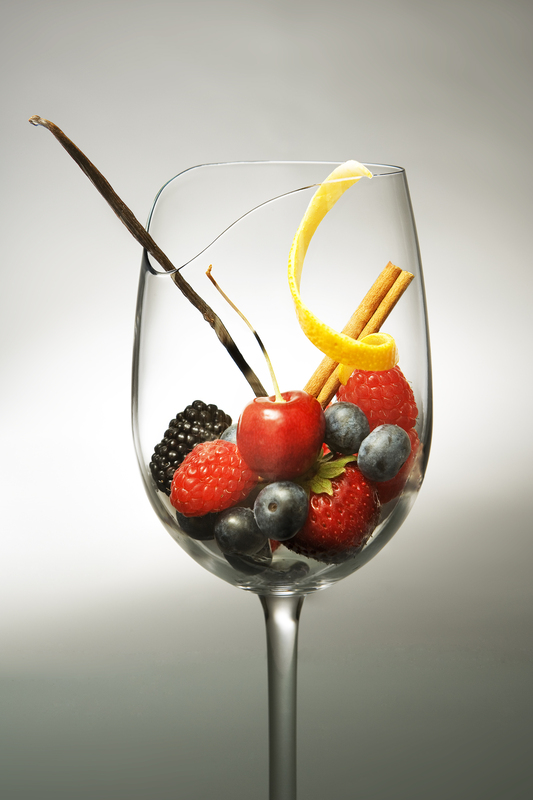 If you’re smelling a red wine and trying to pick out what kind of fruit flavours it has, in most cases you can already discount tropical fruits (lychee, mango, pineapple, etc. ), green fruits (apple/pear), stone fruits (peach/apricot) and citrus fruits (lemon/lime, grapefruit), since these most often manifest themselves in white wines. The question you’re left asking yourself is usually whether the wine’s flavours match up with red fruits (strawberry, raspberry, cherry, plum) or black/blue fruits (blackberry, black cherry, black currant, blueberry). That ultra-specific question is a whole lot easier to answer than the global question “what does this wine smell like?” You can then use the process of elimination to cross off the clearly inapplicable remaining fruits, which will normally leave you with 2 or 3 possible winners that have a strong chance of being quite accurate. Closed questions are easier to answer than open-ended questions: I may not be able to tell you what that Shiraz tastes like, but I can tell you for sure if it tastes NOT like lemons or strawberries or peaches. If you start with groups and whittle away possibilities, whatever is left at the end will probably be right. Practice & Write It Down: Before this blog I never ever wrote tasting notes down; I promised myself a couple of times that I would, but it was a hassle to do and never ended up happening. However, once I had to support a 500+ (or in this case, 1000+) word PnP review with what I was sniffing and swallowing, written notes became an imperative, and I noticed how much more precise I was forced to be when I had a pen in hand. The best way to get good at coming up with wine descriptors isn’t to try 100 different wines; it’s to try 100 different wines and write down everything you notice while drinking them. Once you get in the groove and get comfortable with flavour-hunting, it’s easier to do it notepad-free, but at the start, forget about it…after six months and nearly 60 reviews, I still completely rely on pen and paper anytime I’m really trying to get my tasting thoughts together about a wine. The last thing I will say on this subject is: don’t be afraid to call it like you see it, even if what you see (or smell, or taste) isn’t a “classic” or common wine adjective. Don’t waste a valuable flavour description just because you’re not sure how it will go over at the formal tasting you’re attending. In the last month I’ve described wines on this site as tasting like soap, pennies, copper, cough syrup and Twizzlers — the more descriptive you can be, regardless of how weird the description, the better. Good luck! Just curious, which winery was the SA pinotage from? I checked my WSET course wine log: it was a 2007 Lammershoek Pinotage from the Swartland region — $25ish retail.